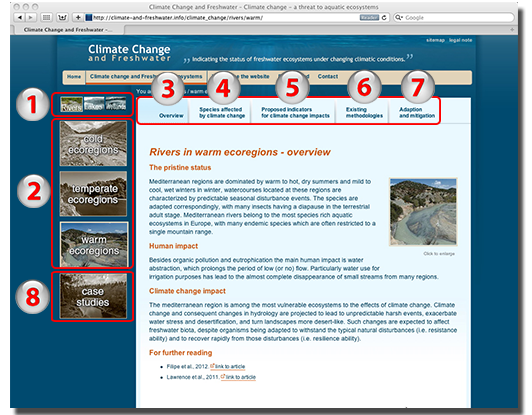 Climate-and-freshwater.info and its associated database present information on the impacts of climate change in freshwater ecosystems. The website is structured in a way that allows the user to find desirable information more easily and display the results in straightforward manner. To find the information more easy we present here a short guide that describes the overall structure and content of the website. Overview, Species affected by climate change, Proposed indicators for climate change, Existings methods, Adaptaion and mitigation and Case studies ( to ). These topics are divided by ecosystem types: Rivers, Lakes and Wetlands ( ) and climatic regions: Cold, Temperate and Warm ( ). First select the ecosystem type you are interested in: Rivers, Lakes or Wetlands. After selecting an ecosystem type chose between three climatic regions: Cold, Temperate or Warm. A short description is given on the main characteristics of each freshwater ecosystem in cold, temperate or warm climatic regions, underscoring the key threats expected to impact their integrity in face of future climate change. The raising temperatures and changes in precipitation patterns due to climate change will result in complex cause–effect chains, linked by many interacting environmental parameters. The degree of ecosystem response will depend on the ecoregion (cold, temperate or warm) and ecosystem type (lakes, rivers or wetlands), and on species-specific adaptations of different organisms. The purpose of this section is to suggest indicators for the effects of climate change on lake, river and wetland ecosystems that reflect the direction of their pathways, relative importance, and magnitude of change. The term ‘indicator’ is used here simply to describe a detectable signal of a complex process that can be used as an early warning of ecosystem change. Indicators may be chemical, hydrological, morphological, biological or functional parameters, which reflect key processes influenced by climate change and are relatively simple to monitor. According to most recent projections, climate change impacts will exert additional stress on freshwater ecosystems. Fluvial (streams and rivers) and lacustrine (lakes, wetlands) systems will experience stronger changes in their natural hydro-morphology as rainfall distribution patterns changes (more rain in the north and less in the southern parts); water quality may deteriorate as more pollutants will be flashed in during floods, or accumulate if the systems runs drier. At the same time, increased water temperatures will be associated with lower dissolved oxygen concentrations and increased mineralization of organic substances. Natural “filters” such as ice cover in cold lakes and rivers or flash floods in mediterranean rivers may become less effective, which will lead to the establishment of invasive species otherwise less tolerant to the natural conditions. This section gives a short explanation on each measure, followed by example(s) of current application of each. The database holds a collection of about 450 measures compiled from various published sources, the bulk, being collected from the River Basin Management Plans (RBMPs) during their initial preparation phase (the WRc report - Nixon, 2008) and after adoption (Nõges et al., 2010). In addition, measures have been included from national climate change adaptation plans, published papers and Internet sources. Climate variables such as temperature or evapotranspiration are very strong predictors of aquatic and terrestrial diversity and set the outer limit to the ranges of many species. Accordingly, a shift in climatic variables can lead to shifts in the ranges of species across latitudes and altitudes (Burgmer et al, 2007). By using meta-analysis techniques and with the help of species distribution models (SDM) predictions can be made of large distributional shifts in species and communities across large geographic scales. A selection of case studies are presented for each ecosystems type (lakes, rivers and wetlands) demonstrating large-scale changes in the distribution of species and communities already occurring or that are predicted to take place in the future.